The tiny Elfin Skimmer male ( Nannothemis bella), less than an inch long! 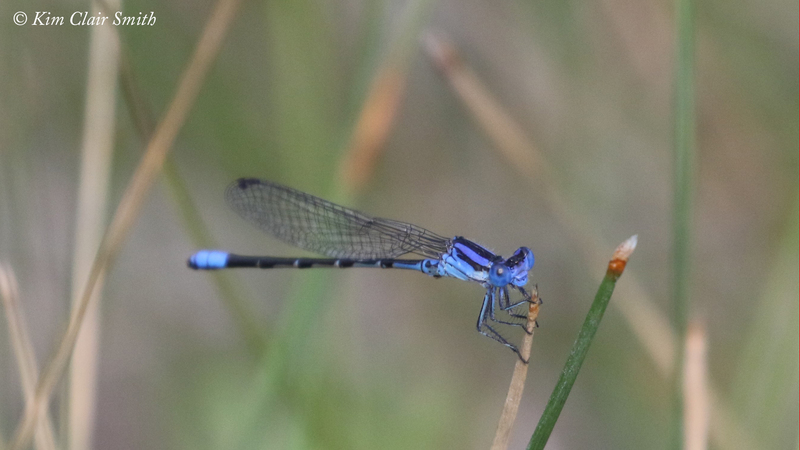 As I said in my last post, my friend Ryan and I finished out the weekend after the dragonfly conference by spending Sunday visiting several spots in search of some more species of dragon- and damselflies. We went to Cedar Bog first and found Elfin Skimmers, Eastern Red Damsels, Paiute Dancers, and Seepage Dancers, all very cool species to see. I’d seen my first of the teeny tiny Elfin Skimmers (Nannothemis bella) at Cedar Bog a few weeks ago, but only saw the males that time. These are the smallest dragonflies in North America, easy to miss unless you know what you’re looking for and where to look. The males are gorgeous, but this time I really wanted to see the females too, as I was told they could be confused for bees if you’re not paying attention. We saw at least five male Elfin Skimmers and I was just about to give up on the females when one landed right in front of me and I was able to get a couple quick photos. 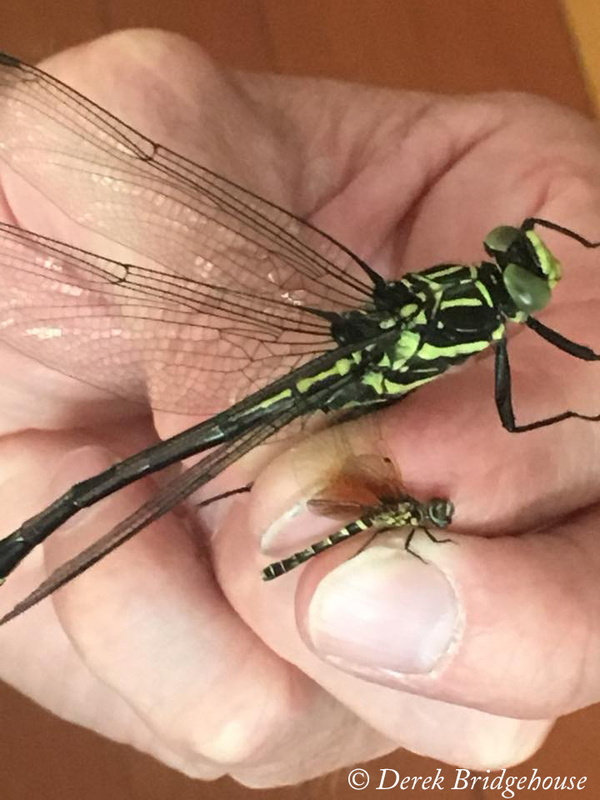 And, as luck would have it, someone in one of my odonata groups just posted a photo of this species alongside our largest dragonfly, the Dragonhunter, for a very impressive size comparison. Thanks to Derek Bridgehouse for giving me permission to show you his photo, taken in Nova Scotia. 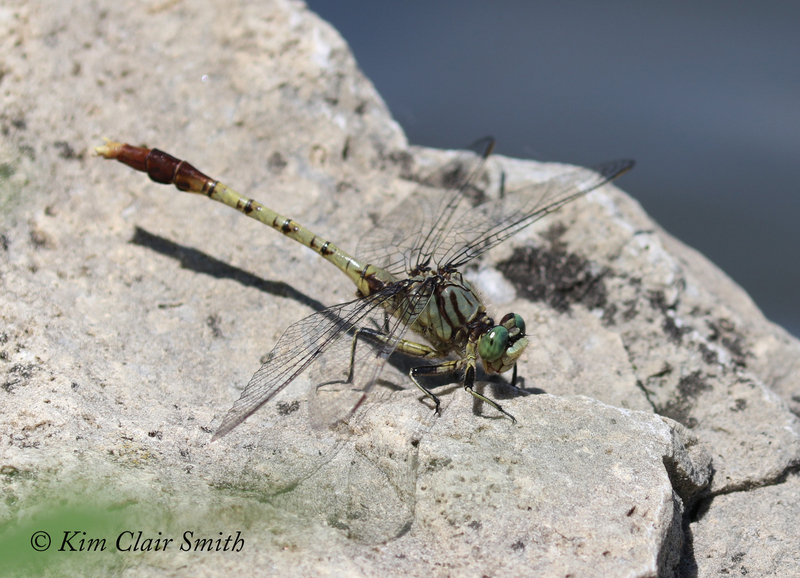 Dragonhunter, above, and Elfin Skimmer female, below. Wowie! Our next species, the Paiute Dancer, has an interesting story. A few weeks ago one of them was discovered in Ohio by Jim Lemon, but not at first recognized as a Paiute Dancer. It took some discussion and consulting with a variety of people before someone realized what it was…and then the excitement grew! 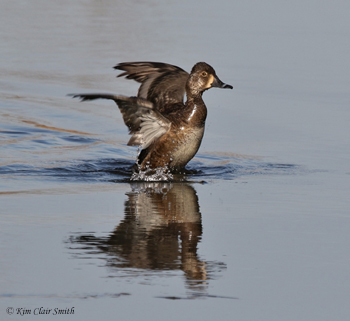 Prior to this sighting, the easternmost records of this species were in Iowa and Missouri, so this is a significant range expansion. But the more interesting part of the story is that since Jim discovered the Paiute at one location, he found more at Cedar Bog, and then discovered that he has taken photos of this species at that location all the way back to 2015 but didn’t realize what he had. And now that we all know it’s here, we look more closely in the field and at our photos later. So because of this interesting story, I was thrilled to find my first Paiute at Cedar Bog on Sunday. On my last trip to Cedar Bog I’d seen my lifer Gray Petaltail but wasn’t able to get a photo of it as it flew tight circles around me before zooming far up into the trees. So this time I wanted to find it again so Ryan could see it, and we both wanted to photograph it. But after two hours of searching, we came up empty and reluctantly left for our next destination. A bit disappointed, we drove to Kiser Lake State Park just to see what we could turn up there. We weren’t having much luck at first, but we suddenly struck gold when Ryan spotted the itsy bitsy teeny tiny Sphagnum Sprites. These guys are also less than an inch long, but the Elfin Skimmer can be a bit smaller than even these guys, believe it or not. We took as many pics of them as we could and moved on. We’d begun checking the time, thinking we’d need to move along to our next target location when suddenly something big flew past Ryan’s head and we both gasped as it landed on a tree trunk about 30 feet in front of us. Gray Petaltail!! When I say “big,” I mean about three inches, making it one of the largest dragonflies in this part of the country. We were both transfixed as we watched this perfectly camouflaged insect repeatedly fly out to grab insects and then come back to rest on the tree. If you took your eyes off of him it was hard to find him again because he blended in so well with the bark. At one point we could see him eating something that might have been another dragonfly. And we saw him try to grab a fritillary butterfly too, but he missed that one. I just learned an interesting fact about this species: Most dragonfly larvae are aquatic insects, but the larvae of the Gray Petaltail are semi-terrestrial, feeding on land insects and spiders. Here’s another view showing just how well his camouflage works against the tree bark. After getting our fill of the petaltail, we headed to our final destination for the day, where we hoped to find the Jade Clubtail. This is another species just discovered in Ohio about ten days earlier, again by Jim Lemon. At Odo-Con, Jim had given us directions to the spot where he’d seen it, including the exact buoy it had perched on. And Rick had been there watching them while Ryan and I were at Cedar Bog and Kiser Lake, so when we arrived he’d already done the hard work for us. We walked along the shore scanning the rocks where Rick had seen a couple of them earlier. He said he hadn’t been able to get very close to them because they were very wary, so we were all surprised when we quickly found one and were able to get within a few feet of it for photos. It might have been just because it was later in the heat of the day and it was tired and too hot to keep moving, I’m not sure. But we felt like we had brought a little bit of luck with us, and we took turns stepping down into the edge of the lake to get photos of the insect’s face as it perched facing the water every time. As I mentioned, it was a pretty hot day and so the dragonfly did what dragonflies do on a hot day: assume the obelisk position. This is a posture that points the abdomen tip toward the sun to minimize the surface area receiving direct rays, which apparently works well to help them moderate body temperature as they sit on hot rocks along the water’s edge. I took my turn stepping down into the water for photos too, and appreciated the opportunity to feel the cool water on my feet for a moment. This was such a satisfying and fun weekend, with great friends and great odes. I can’t wait to see what we’ll discover next! This entry was posted in Insects and tagged #GetOutside, Cedar Bog Nature Preserve, damselflies, discovery, dragonflies, entomology, insects, Kiser Lake State Park, Lake Loramie State Park, odonata, Ohio. Bookmark the permalink. Very Nice! 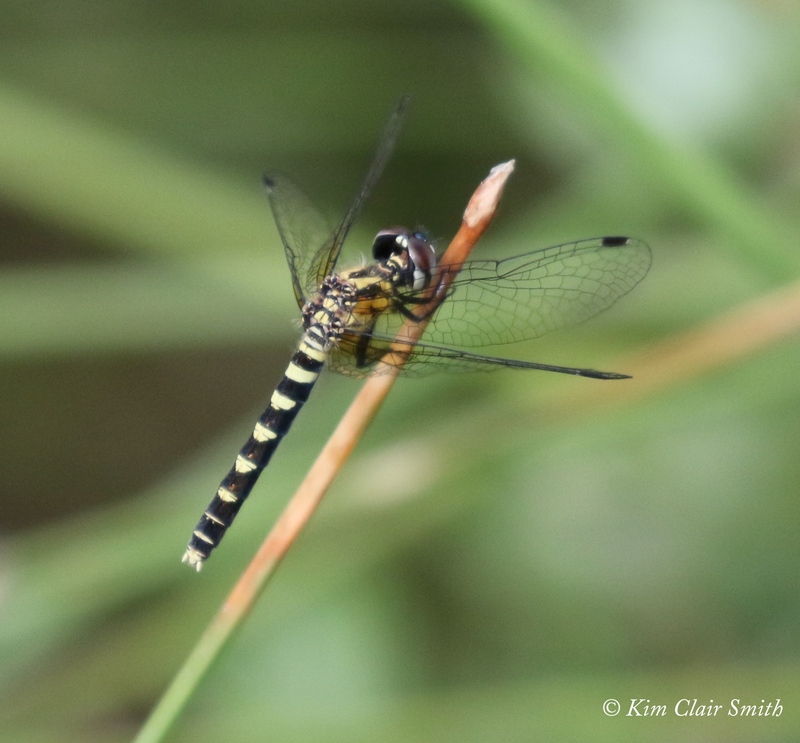 Fun seeing Dragonflies that I have never seen here!